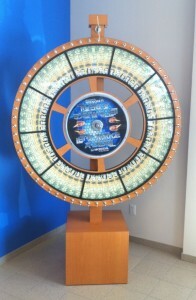 Since 1992, the Prize Wheel Store has designed and manufactured custom prize wheels. Our goal is to help you engage your audience for your next event or presentation. Working for close to 25 years with various clients from casinos and lottery commissions to small businesses and individuals, we are keenly aware of the demands our customers have for quality workmanship and on-time delivery. We know you work on a deadline and a budget, that is why we specialize in a quick 24-hour turnaround on artwork proofs. We pride ourselves on getting your prize wheel designed and built to your exact specifications, delivered onsite, on time, and on budget. All of our prize wheels are custom designed and manufactured to reflect the promise of your brand. The Prize Wheel Store’s prize wheels are made to exacting standards. Since we build for casinos and lottery commissions, and our prize wheels are used in wagering situations, all of our prize wheels are calibrated to be “Certified Random” for a random outcome on each and every spin. We never use particle board or MDF. All wood surfaces are sealed to prevent absorption of moisture, which would compromise the integrity of the spinning wheel, and it’s random outcome. The Prize Wheel Store’s money wheels will never develop a heavy spot. All of our prize wheels feature sealed stainless steel bearings. No lubrication or oiling is needed for the lifetime of the wheel. All pins are rubber-tipped stainless steel, durable and built to last.